Welcome to Tumbleweed Tidings on this cold, cold day in Southeastern Washington! After a very balmy January, us tumbleweed dwellers smugly thought we had dodged the winter bullet. And then February came, with its snow and single digit temperatures. Today we are having blizzard conditions and most weekend activities, even church tomorrow, have been cancelled. Baby, it’s cold outside! 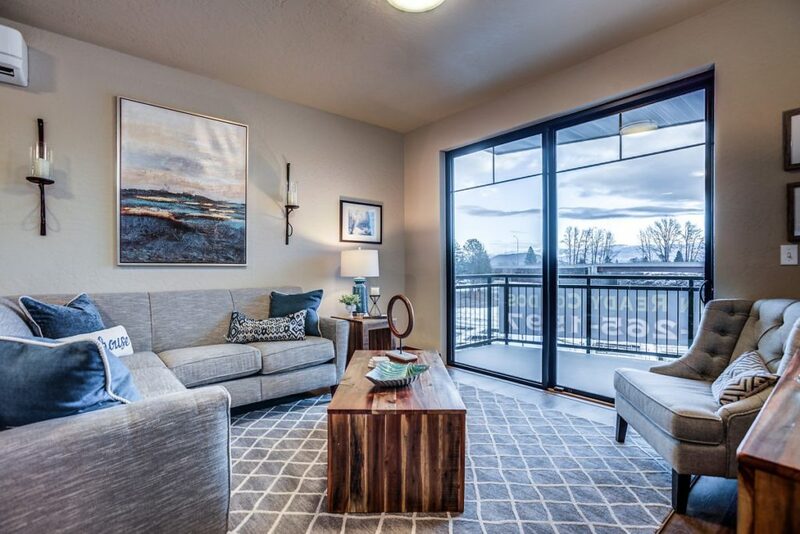 So, just when you were getting tired of my northern Idaho condo staging blog posts, I have one final unit to share. But first, a little trip down memory lane and how we got to today. 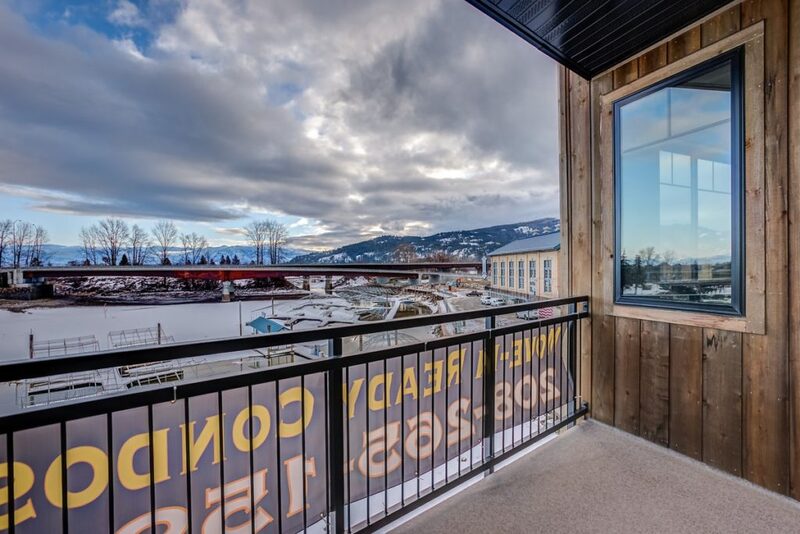 Last summer, I was asked to stage three units in a new build condo property in Sandpoint, Idaho by the project developers. The three were all on the ground floor, and were going to be kept for the vacation rental market. 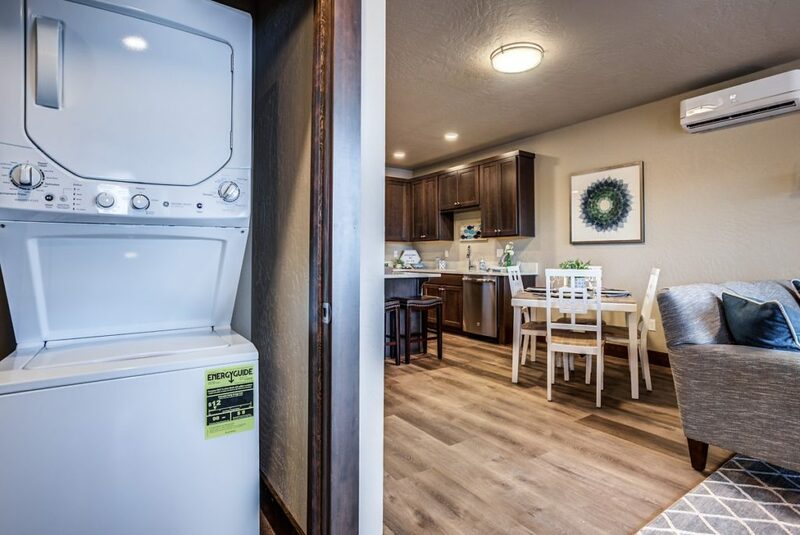 Those three units were outfitted with durable fabrics, full linen and dishware packages, and were turnkey for future renters. My husband, sister and I completed these stagings over the course of a week in late August. In December, the realtor representing the property asked if I would stage two additional units that were for sale. They were mirror image condos, one on the third floor and the other directly above on the 4th floor. They had yet to sell, as they were one bedroom units that read a little small. 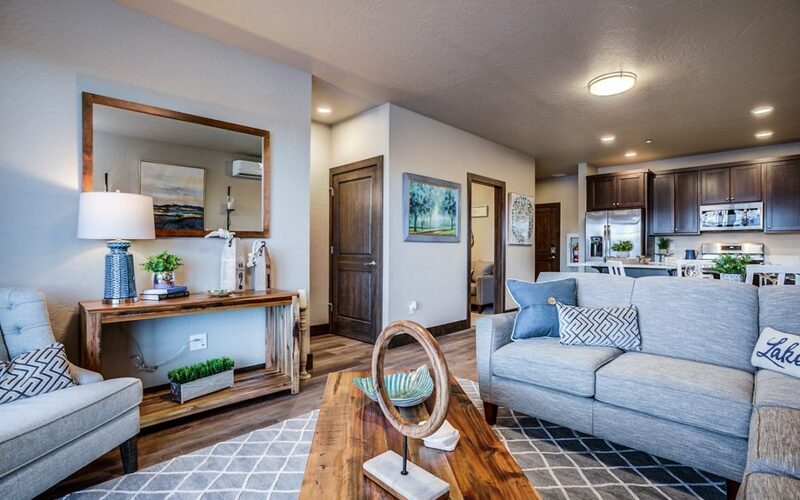 My husband and I staged those two units over a weekend in mid December, and the addition of furniture really showed off the space and functionality they had to offer. Around Christmas, the realtor contacted me again and said she had one more unsold unit in the building that she would like me to stage. Yippee! A chance to shop with other people’s money again!! So I set about selecting a theme, which was done by finding some beautiful pillows and a framed photograph that had all of the colors I wanted. Shades of navy, gray, aqua and wood tones were the direction I wanted, and was able to find ample pieces to complete this look. One quick visit to Idaho to finalize the furniture pieces, and we were ready for installation the following weekend. 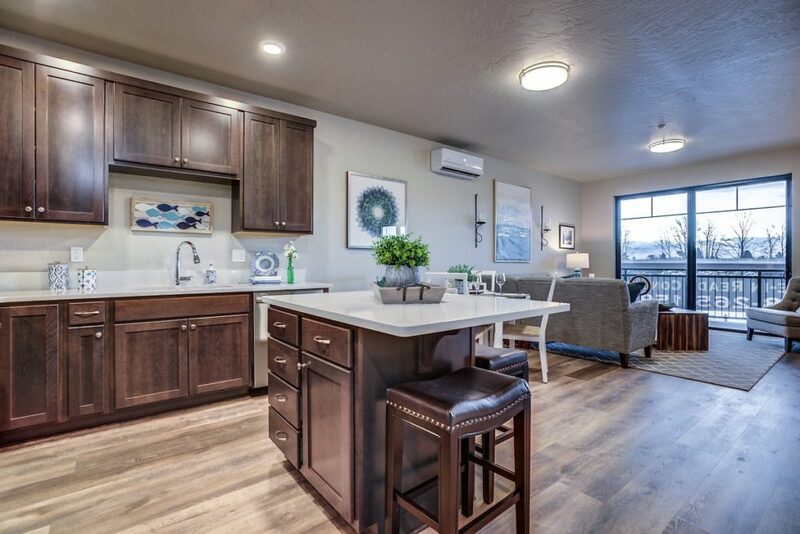 This unit was my second favorite layout of all, with so much natural light and a spacious kitchen. 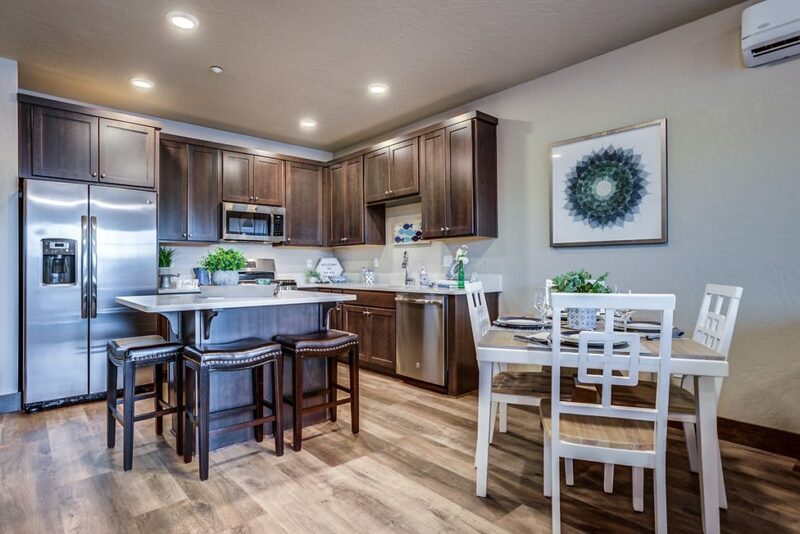 I kept telling my husband “I could live in this unit!” He didn’t have much to say about that…. 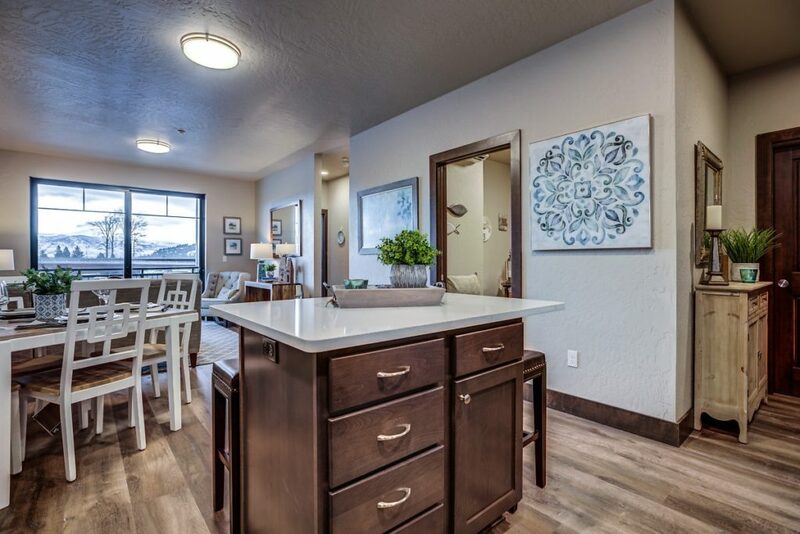 The condo has one bedroom and an office, with a kitchen that opens to the living room and dining area, separated by a nice island. 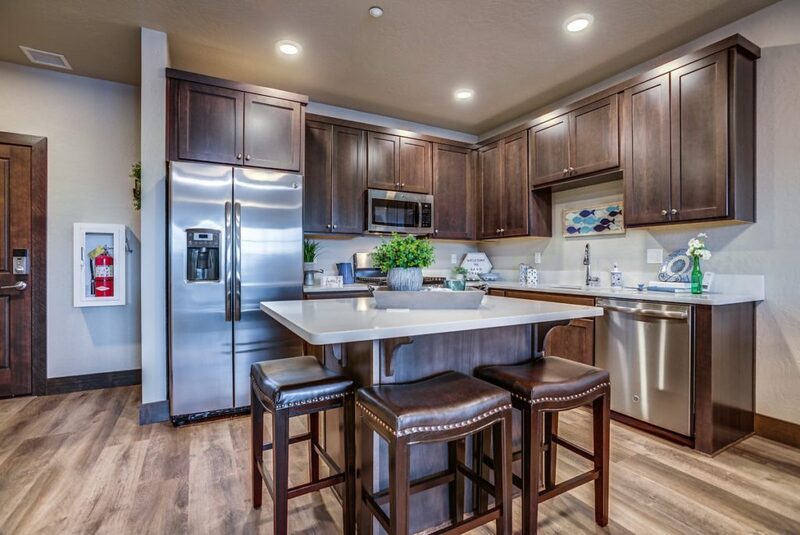 The kitchen has so much storage, as does the closet by the front door. 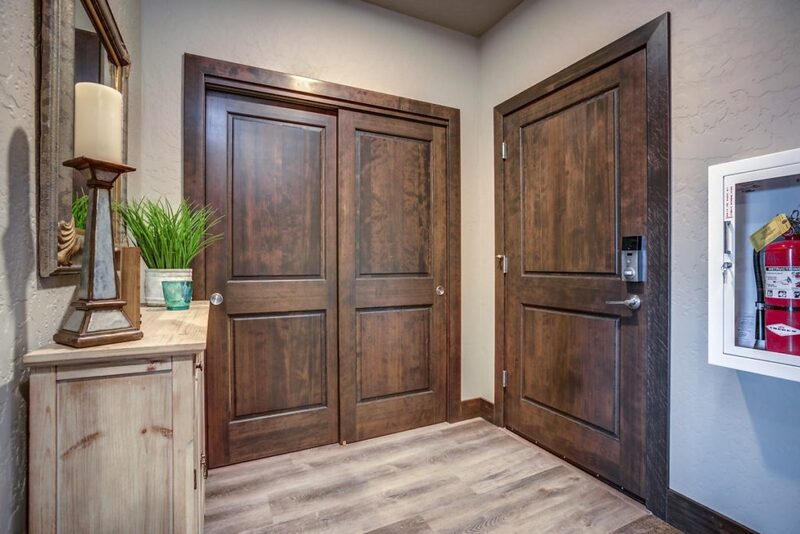 The entryway is spacious and allows space for a console “drop your keys” area, as well as wall space for coat hooks and décor. Funny aside. 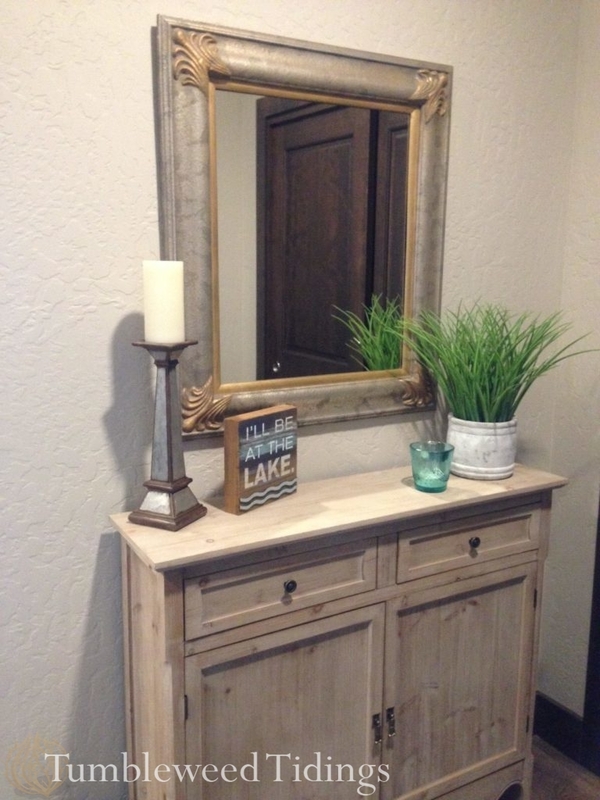 When planning the original list of furnishings from the pictures the realtor sent me, I didn’t realize that there was room in the entry for a console table and mirror. I got the console, along with all of the other furniture from Sandpoint Furniture, but had run out of money for another mirror. While running to the Goodwill to get old books to use as risers, I spotted a large mirror propped on the floor. It didn’t have a price, so I asked the girl. She ran back and asked someone and came back to tell me it was $14.75. SOLD!! It is kind of a dated 80’s or 90’s mirror, but I didn’t care. I modernized it with some greenery in a nice vase, an “I’ll be at the Lake” sign, a galvanized candlestick holder and an aqua glass dish, and it worked just great. Did I mention that it was $14.75?? 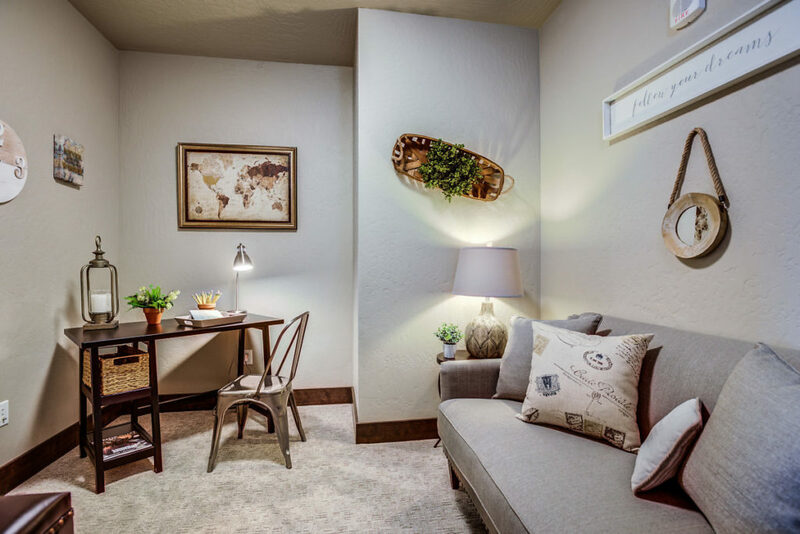 The office, though windowless, is the perfect place for another television viewing area and an additional alcove for a desk or storage bookcase. 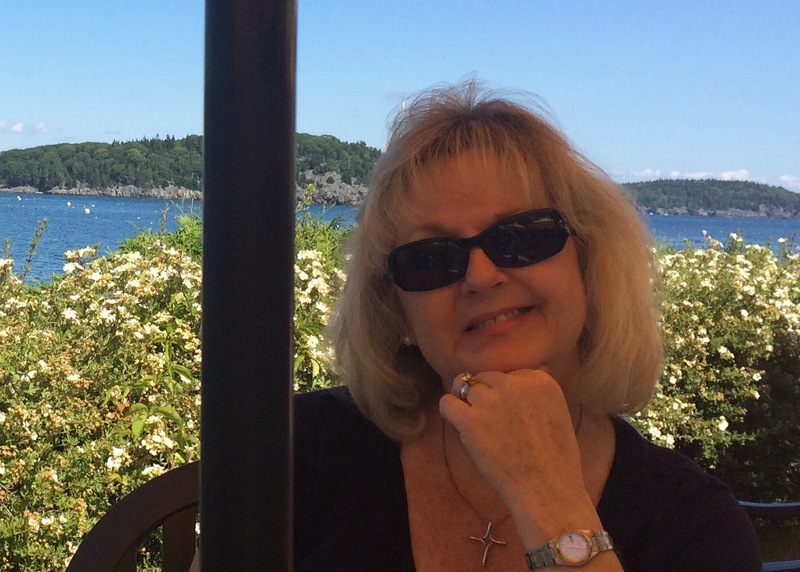 In the office, I kept the palette a little quieter in shades of tan, gray and black. The walls house a large map and other travel related items. The black desk is angled in the corner with an industrial metal desk chair, and topped with pencils, a desk lamp and other office items. 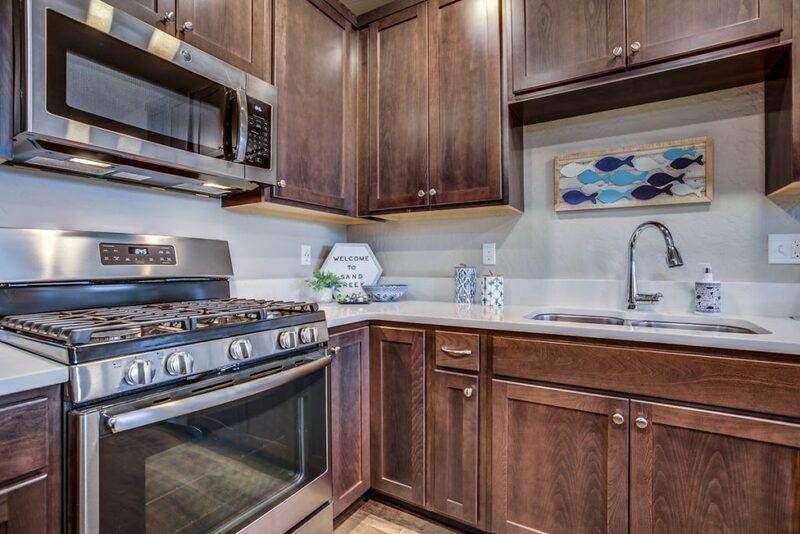 It is very cozy and right off the kitchen, so it is very practical. 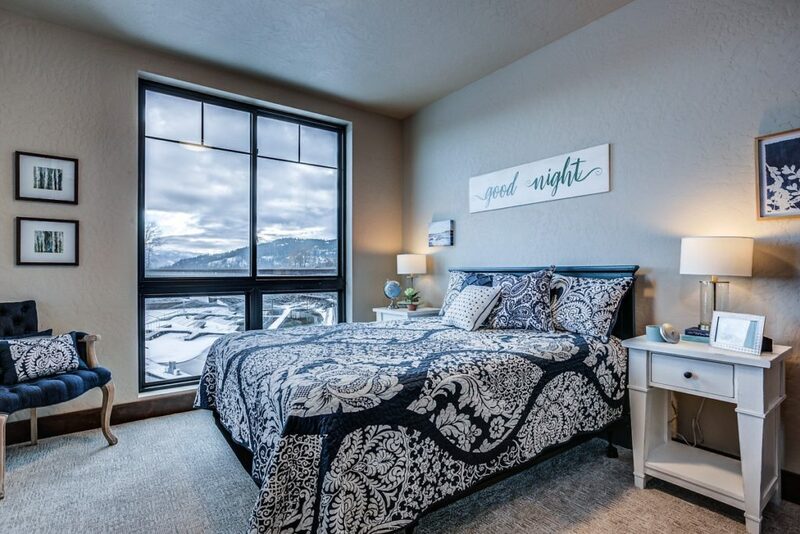 The bedroom has two large windows, one almost floor to ceiling, that bring in loads of natural light and dreamy mountain views. 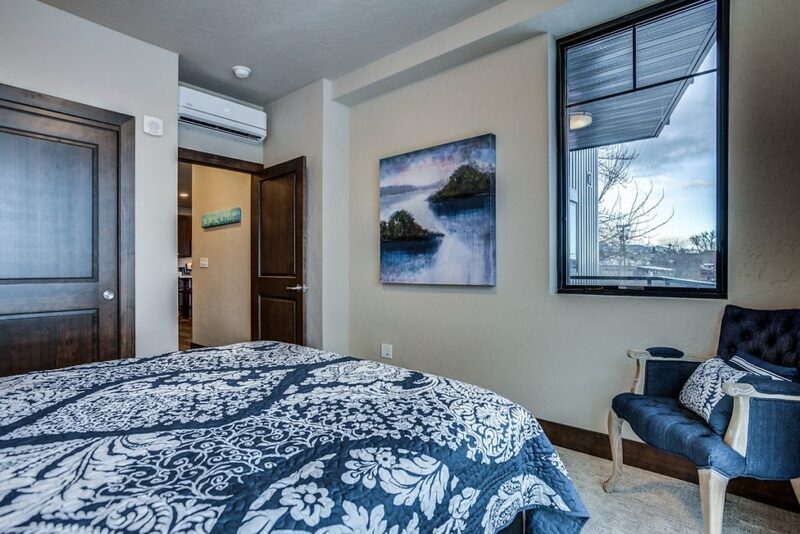 It also has space for up to a king size bed, which is rare in condo living. The comforter set, from Macy’s, is a large scale damask pattern in navy blue and white. So crisp and clean, I just love it. In the corner, I found the cute French chair, tufted and upholstered in navy denim. The white nightstands are roomy and contain additional storage, while the blue wooden headboard adds a nice pop against the gray walls. 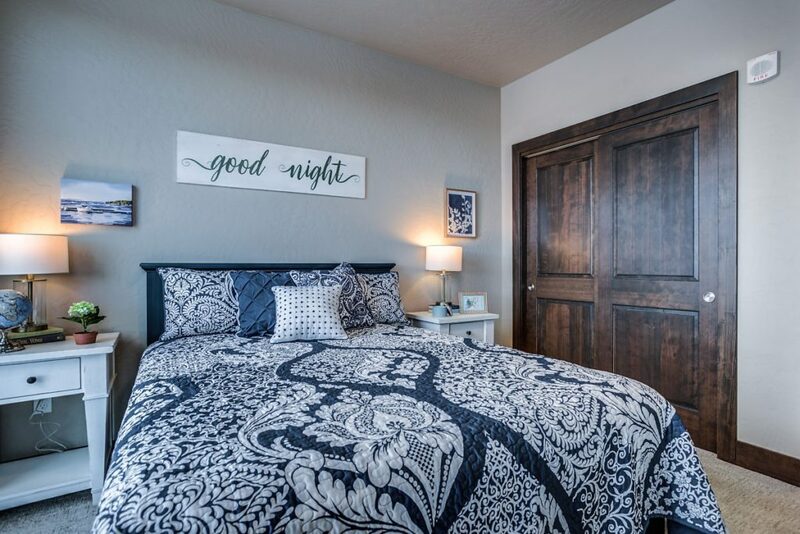 The fantastic “good night” sign above the bed was a custom piece I commissioned with Diana at Oak Street Mercantile in Sandpoint. I told her what I wanted, and voila, she made it just the way I asked with green loopy writing on an aged white board. Now I want one of those signs in my bedroom:) Additional artwork and accessories complete this room. 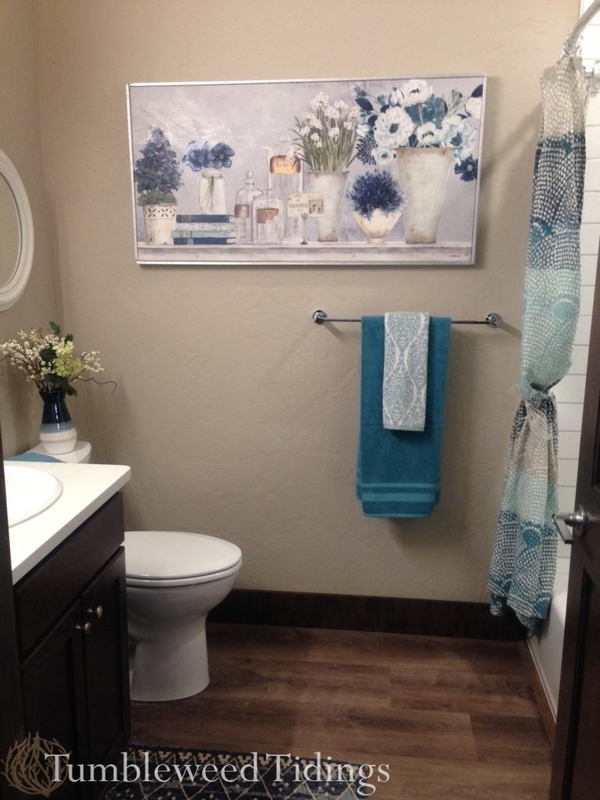 The bathroom turned out really nice (in my humble opinion) with the show-stopping piece of artwork from Home Goods that was the jumping off point for the entire condo color scheme. The shower curtain is from Target, and the rest is filled in with accessories and towels to compliment the picture. 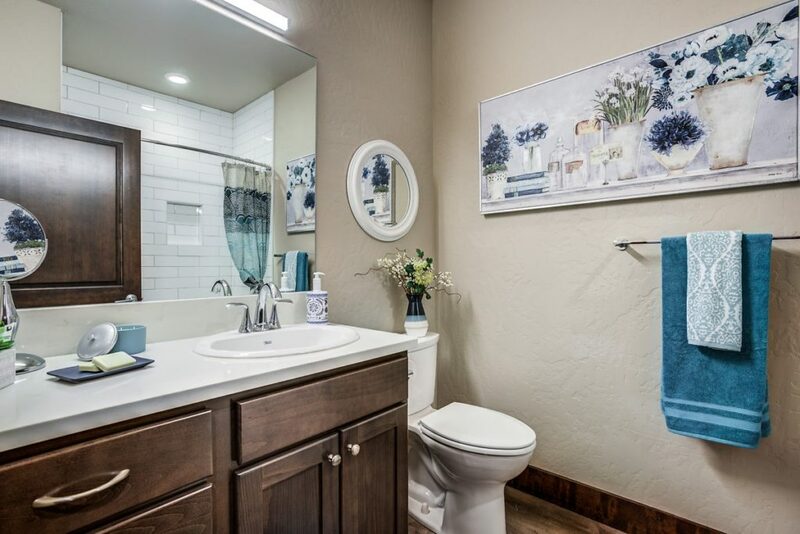 I love how in the picture is reflected in the stand mirror on the vanity, the large mirror over the sink and the white mirror over the commode. That’s a lot of reflection for the money! The dining room is furnished with a white and natural wood table that I ended up placing on the diagonal. With it backing up to the sectional and living area, it just looked more pleasing this way. 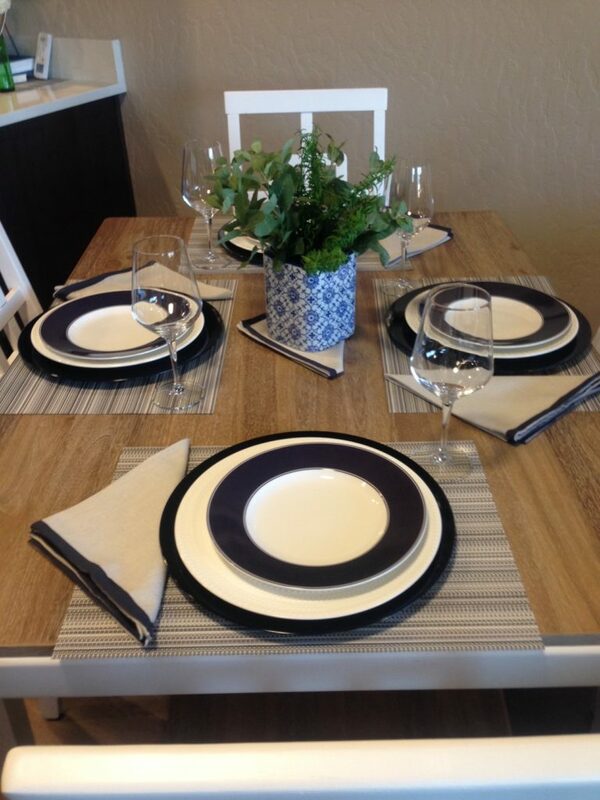 The place settings are blue and white from Kate Spade, with wine goblets and napkins from Home Goods. I love the picture above the dining table! It is hard to tell from the photos, but it is made up of pieces of blue and green tuile fabric, arranged to resemble a large flower. It is so light and airy and just the colors I wanted. Again, this was from Home Goods. 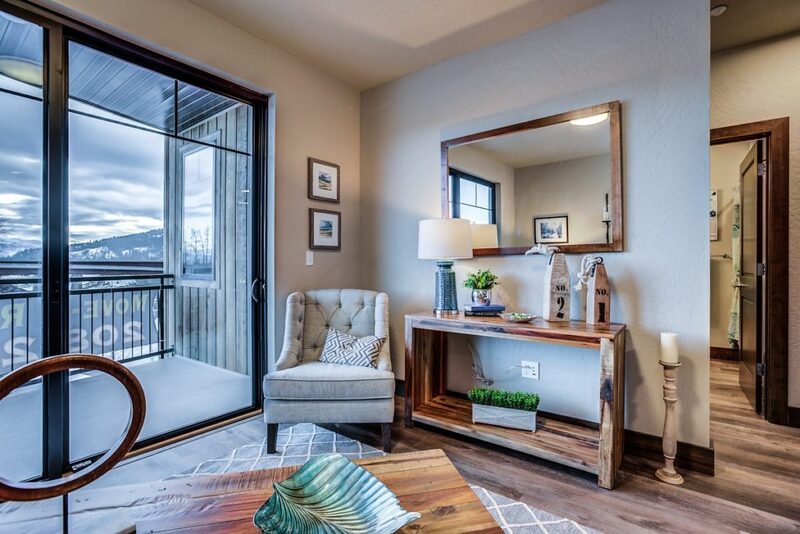 The great thing about the mirror above the console is that when you are seated on the sectional, you can see the northern mountains reflected in the mirror, as well as the marina and east mountains out the window. The bad thing about the mirror above the console is that most likely, that is where someone would put the television:( For the first time in this building, I decided to try a sectional, and I really like how it not only provided separation from the dining room, but created a more cozy conversation and entertaining area. The sectional has a large piece of art flanked by two Pottery Barn sconces to complete that wall. 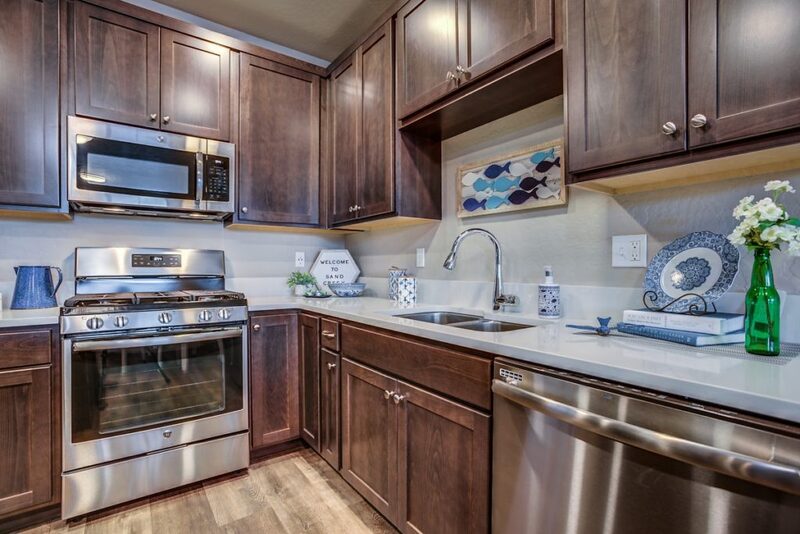 So, if you have been keeping track, this is the sixth condo I have staged in this 16 unit building. Three for the vacation rental market and three for sale. Whew! They are all unique in their palette, size and layout, and it was fun to try different styles of furniture, and play with space requirements to make narrow rooms seem wider, small spaces look bigger, and dark spaces look brighter. 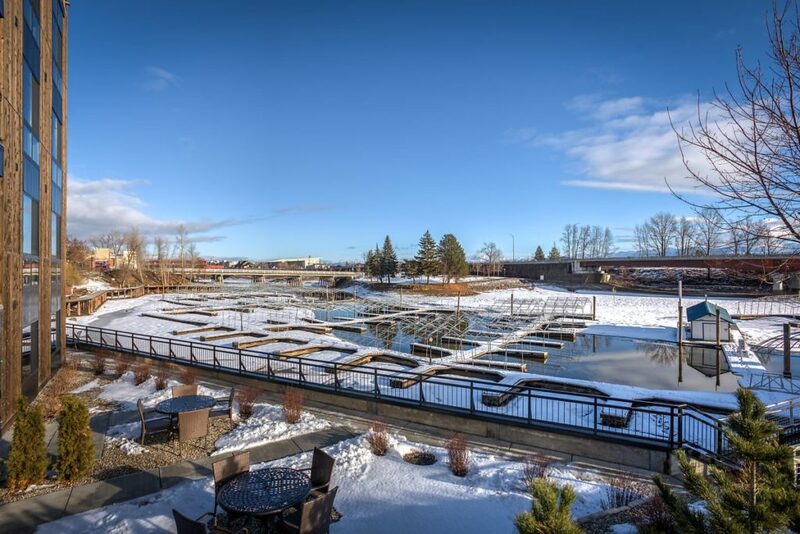 If you or anyone you know is interested in this beautiful waterfront Loft at Sand Creek unit 303, located right in the heart of downtown Sandpoint, Idaho, the realtor said I could share the $379K unfurnished price with you. It is also available fully furnished, but I don’t know that number. If interested, contact Marie at Dover Bay Resort for more details. I don’t work for them in any capacity other than staging and decorating, but wanted to pass that along, as information for my sweet readers. 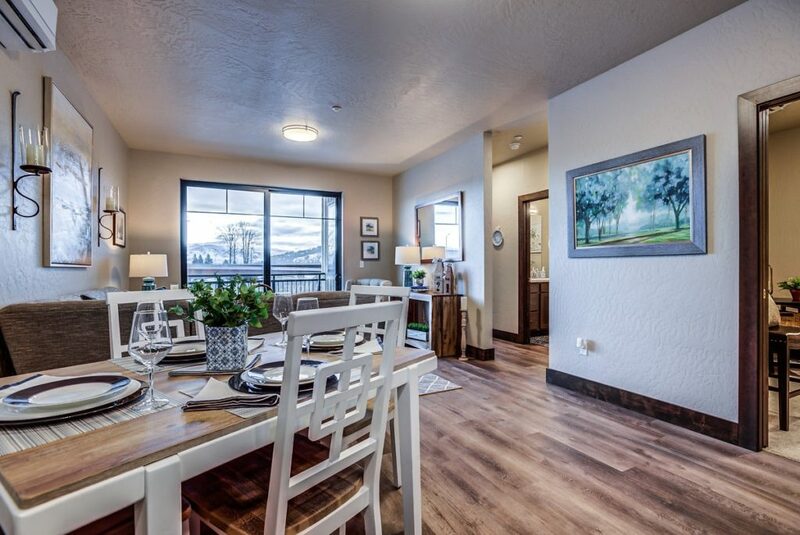 I hope you have enjoyed this last condo staging job for this building. The rest of the units are sold, so I think my work here is done, sadly. The good news is that the same developer is building almost 30 new homes, as well as several condos and bungalows four miles away at Dover Bay, where we have our small bungalow. I am hoping to have more opportunities as those are constructed. In the meantime, I will relax, try to stay warm, and wait ever-so-patiently for Spring. We actually had fun staging these last 2 units. I finally accepted my position as staple puller and move things heavier than 40 pounds. 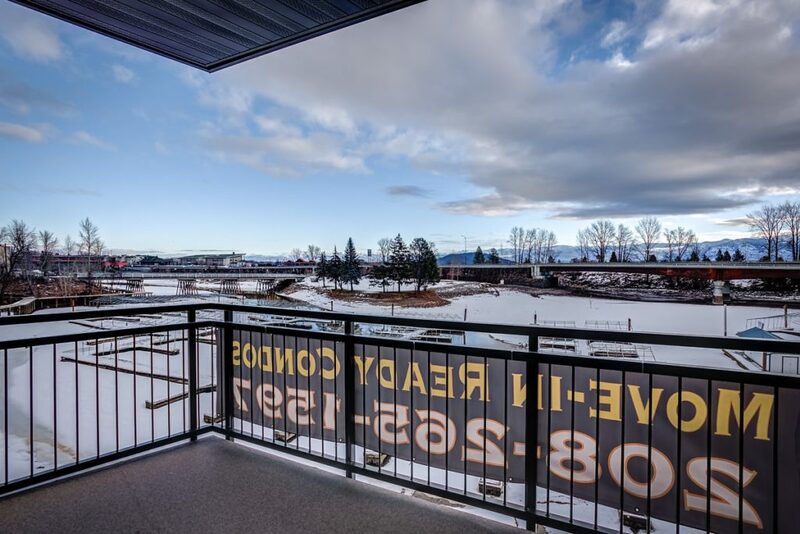 The view from these condos is hard to find at these prices. Love the colors! Very nice! Thank you, Janie! It’s a pleasing palette. Fantastic! I am proud of you both for a great job! The colors are so lovely, the items chosen, and certain things, like the dining room chair backs, are just perfect! Well done. Thanks you! Those chairs do have some nice personality! Thank you! This was my favorite after the large one you helped us with. Love the navy and white in the bed and bath area. This is absolutely beautiful. I love the color scheme. Thank you! Blue and white is always so crisp and clean, and then it’s nice to warm it up with some wood tones and a little gray.